Pick a new feeder for the new year, something you’ve not tried before. Thistle, or nyjer seed is unlike traditional birdseed and will attract different songbirds for your enjoyment. Not only Goldfinches, Buntings, Towhees, Juncos, and Pine Siskins will frequent nyjer feeders throughout the winter, if native to your area. Another advantage of nyjer is that it will not germinate. So there are never any worries of weeds spouting below feeders, weather in the yard or in the flower beds. Squirrels and raccoons generally don’t like thistle either, and usually will not bother these feeders. Part of the healthy for the new year…please think of your feathered friends and responsible backyard birding. Keeping bird feeders clean, and free of damp and moldy seed is paramount if you are attracting wild birds to your yard. Feeders should be cleaned at least once a month with a 10% bleach solution and rinsed thoroughly. Diseases are spread easily among high traffic areas where many birds congregate. The ground should also be kept clean of spilled seed and droppings, picked up at least weekly. Happy Birding, and Happy New Year! The upside down flip rubble bubble cake? Not at all…the upside down finch bird feeder! Of all the finch species, Goldfinches are the only ones who can comfortably perch and eat seed after seed in this fashion. The upside down feeder was developed to accommodate American Goldfinches only, and lessen the competition around the finch bird feeder by House and Purple Finches. Many finches would rather give up and fly away than compete around a busy thistle feeder. There’s an economical way you can accommodate lots of finches with the use of thistle sacks, or nyjer stockings. Made of durable nylon mesh, with some type of draw cord or string closure, the whole surface of the sack serves as feeding or perching space. For just a few dollars per sack, you can hang multiple thistle feeders around the yard and eliminate the competition around your thistle feeders. Shelter, in the form of mature trees, brush, and thickets will add to birds’ preferred habitat, while water in the form of a bird bath, stream or pond will complete it. Attract and keep more birds around your yard with food, water and shelter! Washington, DC (December 28, 2009) .. . . Public outrage is increasing as the Obama Administration proceeds with a controversial Christmas week roundup of thousands of wild Nevada mustangs despite a federal court’s suggestion last week that the action be postponed. Thistle seed, also known as nyjer, is a great way to attract more species of wild birds to your yard. Best know for feeding finches, other species enjoy this versatile seed as well. 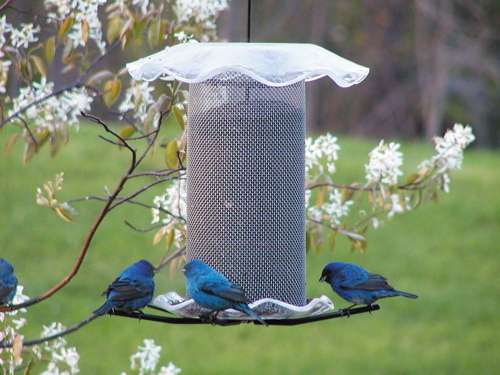 Shown above, Indigo Buntings are perched at this feeder. Guess they don’t mind that it’s really meant for finches? Juncos and Towhees can also be seen at finch bird feeders, as well as Pine Siskins. By adding finely chopped sunflower hearts or meats, you’ll attract these species easily if they are native to your geographic area. The other great thing with finch bird feeders, is that thistle seed will not germinate. No messy weeds to sprout below feeders in the garden or yard. Thistle is coveted for its high fat and protein content, and is eaten almost exclusively by Goldfinches. They will perch at the feeder, eating seed after seed then carry off their prize to the nestlings. The babies eat the exact same diet as their adult parents, so these feeders make for an excellent birder’s observation. As always, a fresh water source will draw more birds into your yard than feeders alone, so be sure to have some type of bird bath available year-round. And remember, Goldfinches aren’t yellow all year, so don’t think they’re not around. Winter weather brings a dull brownish-green plumage, as it is the warmer months of spring and summer that show the vibrant yellow plumage. So You Got a Finch Feeder for Christmas? Here’s what to do next: Go out and buy some thistle seed, also called nyjer seed, and fill that finch feeder immediately! The best way to attract the American Goldfinch is to feed thistle year-round. Although the birds wear a rather drab color plumage during winter months, their vibrant, lemon yellow color is a site to behold during warmer months. They’ve earned the nickname “wild canary” but as their nesting season winds down and fall colors appear, they will molt. This process replaces worn, tattered feathers with a set of new, fresh feathers. Goldfinches are admired for their gentle disposition, and sweet song. Thistle seed, which is high in fat and protein is also enjoyed by House and Purple Finches, Towhees, Pine Siskins, Juncos, and Buntings. 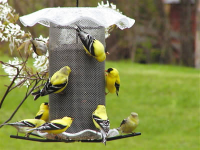 So if your desire is vibrant summer color…keep your new finch feeder filled year-round! Put Finch Feeders on the Christmas List! Say Merry Christmas to them with a new birdhouse or bird feeder! Are you having trouble filling your Christmas list? I am. It was easier and more fun when I could just write a letter to Santa. Santa never made mistakes. Well, except for that time he brought me Elmo underwear. I don t know what went wrong that year. Have you considered a bird feeder? A bird feeder for the backyard is a gift that shortens the distance between wild birds and people. A tube feeder filled with sunflower seeds attracts chickadees, titmice and finches. A platform feeder covered with millet brings in sparrows. Finch feeders will keep goldfinches and others fat and sassy. There are a lot of really good feeders out there and a lot of bad ones, too. It s easy to be drawn to the ones with all the artsy stuff on them. However, there s a good rule of thumb when it comes to bird feeders: the uglier the better. Bird feeders and guard dogs need to look downright ugly to get the job done. A bird feeder in the shape of a church, a castle, or Graceland isn t going to make it through many winters just like a Schnoodle. Even if you take the bow out of its hair, it isn t going to keep many bad guys from stealing the gold you have hidden under your bed. When I say ugly, I don t mean it has to look like a gargoyle or the face of an Ultimate Fighting champion, but it can t have cutesy flowers on it either. A good feeder should be all about lasting for years, and my experience is that the best feeders are made in this country. I have no problem with imported products, but unlike cameras and TV s, the best bird feeders are made here. A good feeder must be easy to fill, but it is more important that it be easy to clean. A good feeder is made to come apart easily so you can remove old or wet seeds. If you can t figure out how to take a feeder apart and clean it, don t buy it. Many people buy large capacity feeders so they don t have to fill them as often. That can be a mistake. In rainy weather, seed will get wet and spoil before it can be eaten. 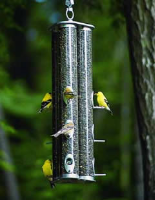 Several small feeders may be a better choice than one that is extra-large. Also, birds are only protected by a thin layer of feathers, so avoid feeders with sharp metal or glass edges. Wooden feeders appeal to many people, and if cared for they will last. However, wooden feeders often will be chewed up by squirrels. If you buy a wooden feeder, you will need to protect it. If you are going to buy the people on your Christmas list only one feeder, I suggest a tube feeder. Tube feeders are usually made of clear plastic 3 or 4 inches around and 18 inches tall with metal perches no, the birds feet won t sick to metal in winter and metal on other key points to protect against squirrels. Good tube feeders keep the seed reasonably dry, are easy to fill, easy to clean, and with baffles, easy to squirrel proof. They cost between $20 and $40 bucks and most come with a lifetime warranty. I know what you are thinking. This all sounds good, but $20 to $40 bucks is a lot to spend on a Christmas present for all my relatives. If that s how you feel, forget everything I ve said and buy them all a set of Elmo underwear. Moving water in a bird bath will make a huge difference in the numbers and species who frequent it. In fact, a fresh water source is one of the best ways to attract more birds. This is because all species of wild birds do not use birdhouses and bird feeders. So if water is the best way to attract them…moving water is even better! Like a visual magnet to birds, the gentle ripples of a water wiggler, or the slow, dripping from a copper tube commands their attention and keeps them coming back. The difference is really hard to believe until you’ve tried it! Whether you have a ground bath, deck-mount model, tall ceramic bird bath, or the new hanging baths with built in misters, moving water is definitely where the action is. Bird baths are one of the most effective ways to attract more feathered friends to your yard. They may not use bird feeders, and many are non-cavity dwelling species (they won’t use birdhouses), but you can bet these birds WILL visit a fresh water source! Especially in winter, when many natural, shallow water sources have frozen over, birdbaths prove to be life savers for many wild birds. With ceramic bird baths, there is the capacity to withstand a heater or de-icer. This makes perfect sense for keeping your bath available year-round for birds. I’ve just never understood why folks empty and turn baths upside down for winter? The need is so great this time of year. When ceramics are glazed, they tend to keep water cooler in summer’s heat too. There are several heaters available that are safe for all birdbaths now, so there’s never any worries of damage or melting. Ceramic bird baths are available in every style and color imaginable. Hanging, pedestal, or even deck-mount (with the use of a special bracket) will all be visited and appreciated by your birds! Even a plain ceramic saucer on the ground, or a tree stump makes for a great birdbath when maintained with fresh water….Just add water and see the difference! An Ultimate Hanging Bird Bath! Water is the single, most effective way to attract birds to your yard. More so than birdhouses or feeders, a bird bath with fresh water entices more species of wild birds and keeps them coming back. Aside from this…moving water is the absolute bird magnet! Birds can’t resist a gentle spray from a mister, or the trickling, glistening water from a birdbath fountain. Even water wigglers, with their gentle ripples do double-duty to grab birds’ attention. 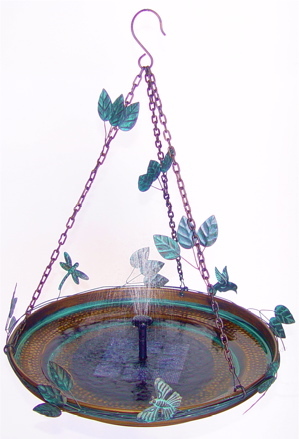 This large hanging bird bath has got to be the ultimate with it’s built in solar mister. The misting bird bath allows for birds to bathe and wade comfortably with it’s multi-level walk in feature. The textured surface, and ample perching areas are welcoming to most species of birds too. 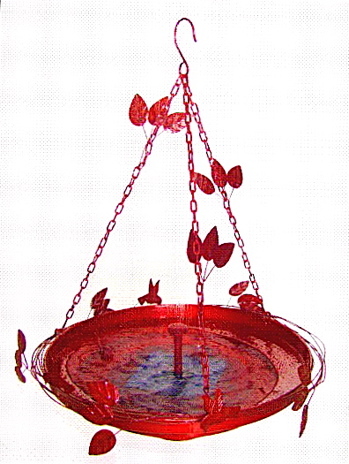 Innovative and unique, the solar hanging bird bath is also available in electric red for ultimate hummingbird attraction, and vivid yellow to attract butterflies. Both hummingbirds and butterflies adore the gentle spray of a mister, and will flit back and forth through them daily. If you’re looking for a last minute gift tat is sure to “wow” and one that will be used daily and enjoyed by many…check it out! 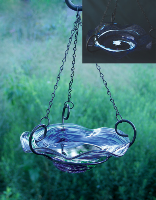 Hanging Bird Baths for Great Gifts! Stumped for the last great Holiday Gifts on your list? Water…it’s the single most effective way to attract birds to your yard. Many species of wild birds that may not use feeders or even birdhouses will flock to a fresh water source. Whether it’s a tall, standing pedestal bath, or a one that’s mounted to deck rail, once birds find this fresh water source, they are sure to return again and again! Hanging bird baths make for great bathing spots for those who prefer the safety of height. Especially where ground predators may be lurking, the hanging baths prove to be an effective spot for songbirds to bath and drink in safety and comfort. With vibrant or natural colors that blend with any surroundings, hanging bird baths make excellent gift choices that will be used again and again, and for many years to come. What better gift than one you know will be appreciated and actually used and enjoyed by the recipient and God’s feathered friends? 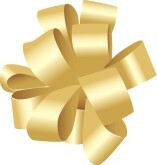 Instead of something disposable, think long-term, and useful for your holiday gift list this year!